In the new movie Interstellar, the earth is dying (a recurring theme in today’s pop culture) and cannot sustain its six billion people. NASA scientists have discovered a “wormhole” in space just outside our solar system. This wormhole allows for space and time to be compressed (remember the theory of relativity) so that earthlings can get to a hospitable, pristine, earth-like planet where human earth-life can begin again. Who made this wormhole, or who allowed earth people to know of its existence? The characters in the movie can’t bring themselves to say that it is part of God’s plan, presumably for fear of offending somebody. Welcome to the world of political correctness. 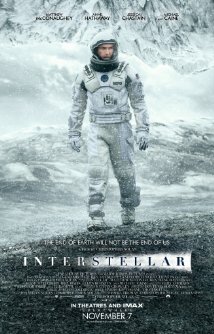 Interstellar is long (eleven minutes short of three hours) and loud, with a pulsing music score that, even though it’s good music, seems to get in the way at times of the audience being able to hear what the characters are saying. My problem throughout much of Interstellar is that a lot of the dialogue is incomprehensible. I might have felt more engaged by the whole thing if I had known what was happening as revealed by what the characters were saying. And when the explorers land on another planet, it’s disappointing because all we can see is water. Where are the exotic inhabitants and strange (to us) plants and animals? Who wants to see only water and waves? We have that on earth. I got a similar feeling from Interstellar that I got from Elysium, Inception, Prometheus, and other movies. The cleverness of it gets in the way of the story. I don’t want to be blown out of my seat by special effects, gimmickry, and sound design. I want to be blown out of my seat by a believable and beautifully written story that I’ve never seen before.